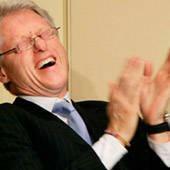 No Prenup for Jess Simpson + Bill Clinton Cameo Appearance? More on Jessica Simpson’s Engagement…..
With happiness comes a slew of nasty rumors, and juiciness we all just can’t get enough of! A little lesson in tabloid history- When Simpson married Nick Lachey, they did so without an pre-nup. When Jessica’s star status rose, so did the numbers in her bank account. Long story shot, Lachey reportedly walked away with $10 million of his ex’s hard earned cash! Apparently, Simpson is so smitten with her fiance that she is against inking her name on a pre-nup. Jessica! Please protect your $100 million empire! Everyone is rooting for you to happy. Listen, you can give your fiance a weekly allowance to support his hobbies and needs. Ok? No bets on this one please. Lets just hope they live happily ever after folks. Some Presidents take to relaxing at home, penning a book, or trying to make world peace. Not former President William Jefferson Clinton– He does it all! According to various reports, Bill Clinton shot a cameo for “The Hangover 2” in Thailand! How cool of him!!! Clinton was spotted on the set’s flick in Bangkok, Thailand on Saturday. Sources report that Clinton will indeed play himself in the sequel. I hope the former Mr. President had fun and poked fun of himself! Clinton was already in Bangkok on business. He delivered a speech on clean energy. Paul Giamatti is rumored to be en-route to Thaliand to join the director Tod Phillips and stars of the original cast- Bradley Cooper, Ed Helms, Zach Galifianakis and Justin Bartha. The firm is set to be released in the summer of 2011.